JV 44 is established at Brandenburg-Briest with immediate effect. Ground personnel are to be drawn from 16./JG-54, Factory Protection Unit 1 and III./Erg JG-2. The commander of this unit receives the disciplinary powers of a Divisional Commander as laid down in Luftwaffe Order 3/9.17. It is subordinated to Luftflotte Reich and comes under Luftgaukommando III (Berlin). Verband ‘Galland’ is to have a provisional strength of sixteen operational Me 262s and fifteen pilots. “In the previous August 1944 meeting, Speer and I had discussed the critical fuel shortages experienced by the military all over Europe. Speer had just met with Hitler and Göring the previous month, and he was also working on increasing fighter production, and I had previously given him the recommendation that the Me 109 be phased out, and only Fw 190D and the later models be produced as far as conventional aircraft. I also told him, following my first test flight in the Me 262 jet at Rechlin, that this was the fighter we needed to focus upon. This was also the subject of discussion in 1943. “However, as the world knows, Hitler had other ideas. Göring knew the reality, and he was very excited by the 262, and told me personally that he would see to it we received the new fighter. He read the reports on how and why it was a better fighter. It was not just the faster speed and heavier armament, it was also able to operate on much cheaper and readily available fuel, and did not require the high-octane fuel that the conventional fighters did. Speer also mentioned that, in order to appease Hitler, he would increase construction on the Arado and Heinkel jet models as bombers, allowing us to have the 262 as a fighter. “Speer and I again met with Hitler, and Speer tried to get him to rescind the order to have the two thousand new fighters just built sent to the Western Front. I agreed, and I explained to Hitler that, given the tactical situation, lack of fuel, few highly qualified and experienced pilots, that the best we could do would be to use these aircraft as a protective force at our critical industries, especially the petroleum and aircraft locations. Speer even gave him the data, which normally Hitler would examine in great detail. “Speer and I did our best to persuade him. It was like talking to a deaf man. I explained the situation to Hitler, and also gave him proven statistics, but he went mad. He then stated that he would order the halt to all fighter aircraft production, the fighter arm was to be disbanded, and those industries were to be then focused upon building flak guns. He firmly believed that flak guns alone would keep Germany safe. I could not believe it. “It was during this meeting that Göring brought up the possibility of strafing enemy pilots as they bailed out, and he asked me my thoughts on that subject. I told him in no uncertain terms that I would never issue that order, and I would court-martial any man who I could prove did such a thing. I also invoked the Geneva Convention, explaining that such a method was illegal. “Göring seemed less interested in the laws of warfare, and as I learned much later after the war, I understood why. He was more concerned with the image of the chivalrous fighter pilot being tarnished, so he did not really push the issue further. He also told yet another story of his days in the Great War flying with Bölcke and Richthofen, and how chivalry was only seen in the air. Enemies respected each other. I agreed with him. The killing of parachuting airmen was then dropped. “I knew from experience, after the Battle of Britain, and seeing the RAF ability, that if these fighter pilots had shorter distances to travel, they could concentrate on a smaller operational area, and focus upon attacking the enemy bombers over or near targets, that several things would happen. First, our men shot down would be able to be back in the air more quickly. Second, the larger numbers of German fighters in a more concentrated area would provide more opportunities to attack enemy bombers. Third, it would save on fuel. Hitler waved his hand and said he had heard enough. He had absolutely no interest in discussing anything that would have made him change his mind. “I made Steinhoff my recruiting officer, and he traveled to all of the major bases, picking up pilots who wanted to once again feel a sense of adventure. Steinhoff managed to collect some of our best pilots, although not all of them. This was a direct result of my last meetings with Hitler in January 1945, and with Göring in December 1944, before the meeting that I was not invited to in January where I was fired by a telephone call; and those officers who supported me were likewise in a lot of trouble. “We had most of the greats, like Gerd Barkhorn, Walter Krupinski, Johannes Steinhoff, Heinz Bär, Erich Hohagen, Günther Lützow, Wilhelm Herget, and others. I tried to get Erich Hartmann, but he wanted to stay with JG-52. That decision would prove very costly for him at the end of the war. We were finally stationed at Munich-Riem, and on March 31 flew the first of several missions, and later we were very successful using the R4M rockets, which we fired at bomber formations. The first confirmed victory over a fighter for JV-44 was on April 4, 1945, when Eduard Schallmoser miscalculated an attack, and crashed into the tail of a P-38. This was perhaps not the best of beginnings, but it at least showed we had determination. “I adopted a fairly informal approach to conversion training on the Me 262, feeling that time was running short and wanting to make it easy for the veterans. We had no instruction manuals or visual aids and the lessons were held in the open air with all of us squatting on the earthworks that had been thrown up around the jets. Or we sat on plain wooden benches near the telephone, on the alert, and I explained how one flew the Me 262. “I told them what to do in order to fly it correctly, and what they absolutely must not do. I spoke of the aircraft’s weaknesses, how it was very slow to gain momentum, jolting along the grass for an apparently endless length of time before one could risk pulling the stick back, and then only very, very carefully because an angle of incidence of one or two degrees sufficed to provide enough lift and because too steep an angle, caused by pulling too sharply on the stick, could kill one’s speed, and with it oneself. JV-44’s missions and table of organization were rather unusual when compared with the conventional fighter units. Rarely did a unit at squadron strength operate under the command of lieutenant general, with the majority of the pilots holding the rank of lieutenant or higher, flying wingmen to lieutenant colonels. Also, there was no other unit in the Luftwaffe that had most of its members wearing the Knight’s Cross—and half of those being the Oak Leaves or even higher. One of the problems regarding their readiness for missions was explained by Erich Hohagen: “There was no local radar station, or even a main detection system that we had access to. There was a large station near Munich, which we used since we did not have one. We were like a gypsy band, moving here and there. We had a short-wave radio, which was mostly used for air to ground communications with our fighters, and a telephone, and when it rang, that was to usually inform us of an inbound enemy bomber formation. We rotated our pilots in and out of the cockpits, starting sun up and ending at sundown. During April through May, we kept the engines warmed up every two or three hours, making sure that the fuel lines were completely filled, no airlock, which would force a jet to be grounded until it could be cleared. However, JV-44 was also quite similar to most other units, in that the attrition rate among its pilots was high. Even the most experienced fighter pilots still felt themselves in a learning curve. The first missions were light duty compared to what most of the pilots had experienced during the war, especially the men who had flown on the Eastern Front, or in the West against the ever-growing American air armadas that never seemed to stop coming. 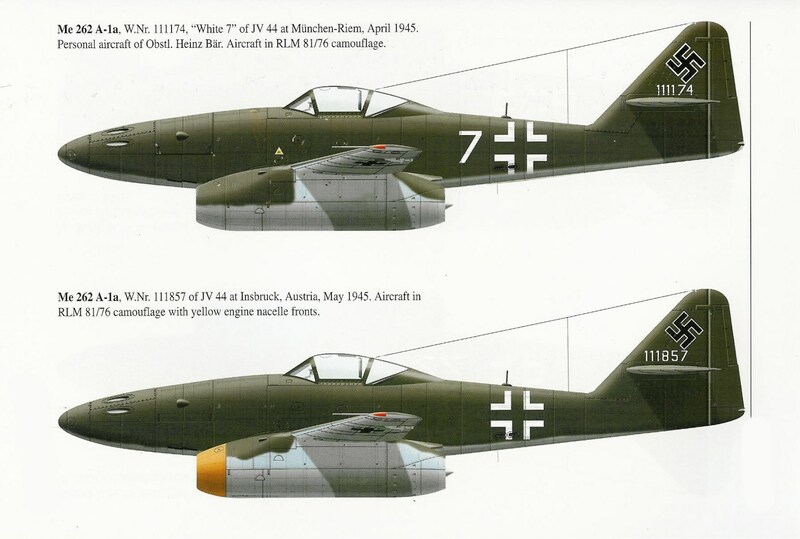 Klaus Neumann described what it was like flying in JV-44 after his experience of flying in Russia with JG-51 and later in the west against the bomber formations with JG-3: “The jet was a remarkable departure from flying the Me 109 or even the Fw 190. Do not get me wrong, as both of those were fine fighters. The 190 was a much better aircraft when it came to attacking bombers, and I did do rather well with that business. It could also take a lot more damage than a 109, especially since it had a more rugged airframe and air cooled engine in the A series of the fighter. It was fast and maneuverable. “But the 262! It was like being a god in a way: fast, great firepower, and you had a lot of confidence in the plane. As long as you were not tangled up with enemy fighters or too heavily damaged after attacking the bombers to have reduced speed or maneuverability, then you always had a great chance of getting home. Once we had the R4M rockets, it gave us that extra punch; fire the rockets, do the damage, weaken the tight formation integrity of the bombers, then pick off the crippled stragglers. “Once Weissenberger took command, we received a flurry of transfer requests, so many pilots just wanted to get away from him. I knew Theo, he was a great pilot and had fought a hard war in the Arctic, and he was also one of the bravest men in the Luftwaffe. But, he had his issues, alcohol being one of them, and his attitude was more like that of an overlord, very strict, and many of the men had grown comfortable under Nowotny’s relaxed method of command, from what I was told—and Galland even told me that. I was also a professional, but a relaxed sort. I never had to raise my voice to get the job done. It was just done, but that was because I placed a lot of trust and responsibility in my subordinates, allowing them to show me what they could do.